Any digital nomad will know the importance of three things: a good cup of coffee, a fast WiFi connection, and comfortable sofas (bums get sore after a few hours!). Earlier this year, we spent two months in Vietnam, eating, slurping and working our way around the country. Whenever we based ourselves in one place for longer than a few days, we sought out the best places to work from – typing away in a hotel room can get rather suffocating after all. Luckily for us, Vietnam is a country of caffeine lovers, as you’ll see in the guide we put together on Vietnamese coffee, and in pretty much all of the bigger towns you’ll find some form of café scene. Here are just some of the places we loved to work in while we were in the country. 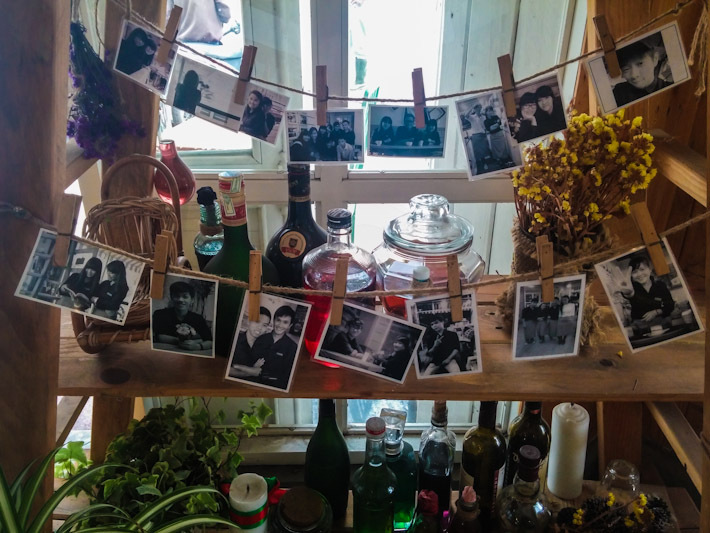 The lowdown: Our favourite coffee house in Vietnam, this place is the coziest and most comfortable of the lot. The setting is stunning; the upstairs terrace, for example, has foliage growing up the walls and is adorned with fairy lights, while inside there are loads of inviting sofas and cozy corners for you to get lost in a book in while you sip on your coffee. But unfortunately we weren’t there to chill – we were there to work! The coffee? Yummy. And if you’re looking for a special treat after you’ve finished your work, try the Sand Dune – two shots of espresso mixed with Baileys, Kahlua and rum. Yes, it’s as delicious as it sounds. What about the nosh? Didn’t get to try the food here, so cannot comment, unfortunately. Comfort level? Top notch. We loved the wall-to-wall sofas and beanbags in the lounge upstairs. WiFi? It was consistently fast for the time we were there. Conclusion: If you’re looking for a cozy corner from which to work, this is your place. Our only complaint is that it’s a little too cozy. I would have preferred to have been free to sit and read there instead of work! I blame the dim lighting. The lowdown: This chic venue was our go-to place whenever we craved a latte. The café has plenty of massive tables to sit at, which is a blessing when you’re a digital nomad. You can spread out as much as you want here. The coffee? As mentioned, this is where we headed whenever we were hankering after a latte. They also do a pretty great Vietnamese coffee. What about the nosh? Their sandwiches are phenomenal. We strongly suggest you try the mushroom and olive stuffed chicken. Comfort level? Good. The big tables are a plus point. WiFi? Sketchy, unfortunately. On one particular day it was so slow it literally came to a halt at times. Conclusion: The food is incredible, the workspaces are great, but the WiFi lets it down. It’s still a great place in which to get some writing done, though. 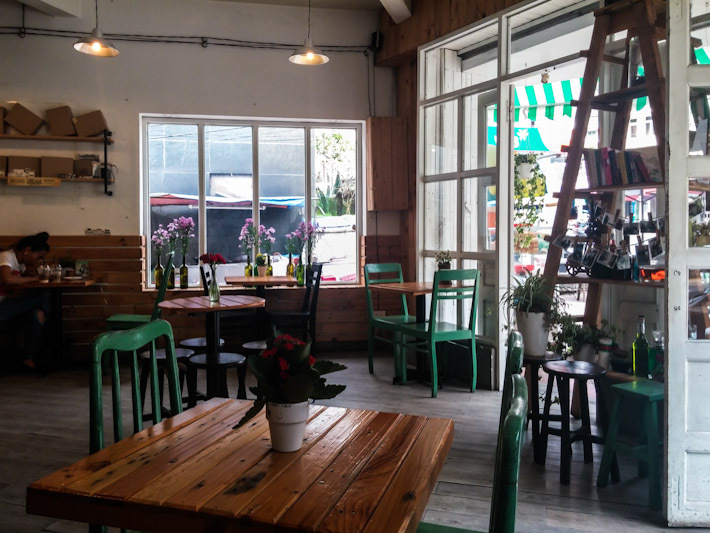 The lowdown: Da Lat doesn’t have much of a café scene, so we were happy to come across this teeny place on Phan Dinh Phung, which is one of the town’s main streets. It’s rather kitsch, but it’s a nice spot to work from for a few hours. The coffee? We stuck with Vietnamese iced coffees while we were here, which were decent. What about the nosh? Didn’t try it so cannot comment. Comfort level? Standard wooden chairs and small tables, so not the best of aesthetics. However, it’s comfortable enough. WiFi? Good. No issues with it. Conclusion: In a town that lacks a café scene, Windmills is a cute place worthy of your patronage. The lowdown: The swankiest café in town, by day this is a great place to get some work done in while admiring the sea view. The coffee? Not the best, so we opted for fresh watermelon juices instead. What about the nosh? Too expensive to justify it for lunch! Comfort level? They have some really comfy wicker chairs to sit on while you enjoy the amazing view…and your to-do list. Conclusion: Whatever this place lacks in good coffee, it makes it up with its view. If you get inspired by looking out to sea, then this is the place for you. The lowdown: Located bang in the middle of the charming Ancient Town of Hoi An, The Cargo Club offers a lovely view out onto the street where you can admire the town’s characteristic yellow buildings. It also sells the best pastries we tried in Vietnam – you’ve been warned! The coffee? Their Vietnamese coffee was one of the best we had during our whole time in the country. Deliciously caramel like – just how it should be! What about the nosh? 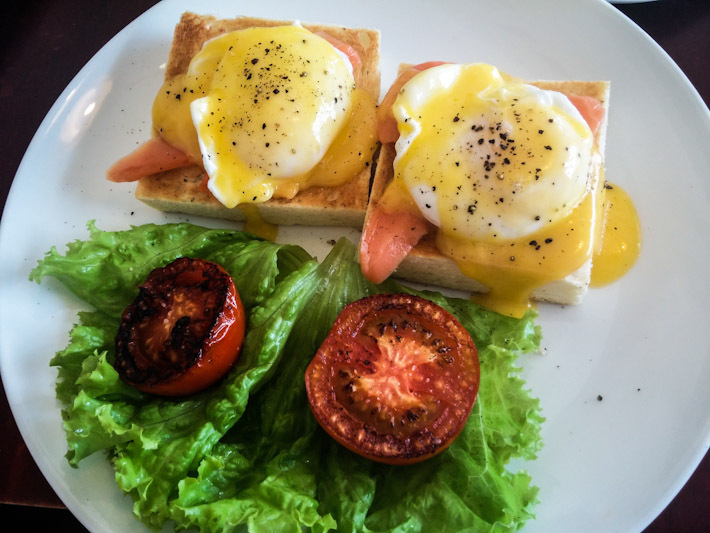 Try their breakfasts, which are delicious and amazing value for money – for approximately $10 (for two) you get a choice of tea or coffee, juice, a big breadbasket, fresh fruit, as well as the main that you choose – we opted for an English breakfast and Eggs Benedict. Their pastries are also amazing – try the cinnamon roll. Comfort level? It’s great. We opted to sit towards the back in the corner where they have massive tables and comfy chairs. So cozy! WiFi? Overall it was fine. Conclusion: This was a gem of a place and we were really sad to say goodbye to it after working there pretty much everyday for almost two weeks. 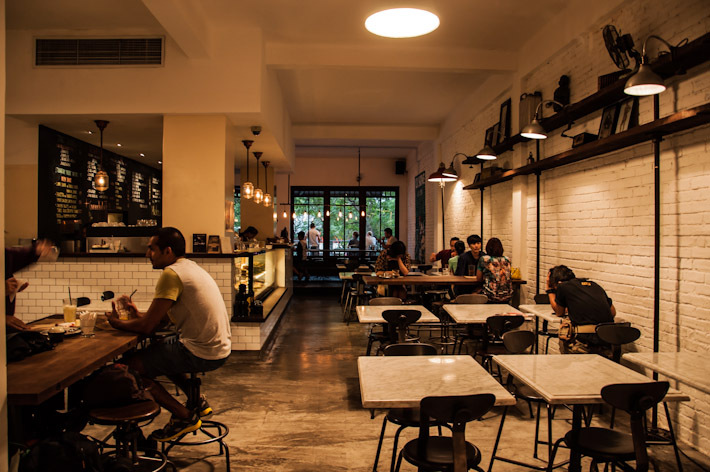 The lowdown: An eclectically designed café near the old quarter of the city, The Hanoi Social Club is the kind of place I’d imagine hipsters would hang out in – only minus the hipsters (bonus!). The coffee? Their lattes are definitely worth trying! What about the nosh? 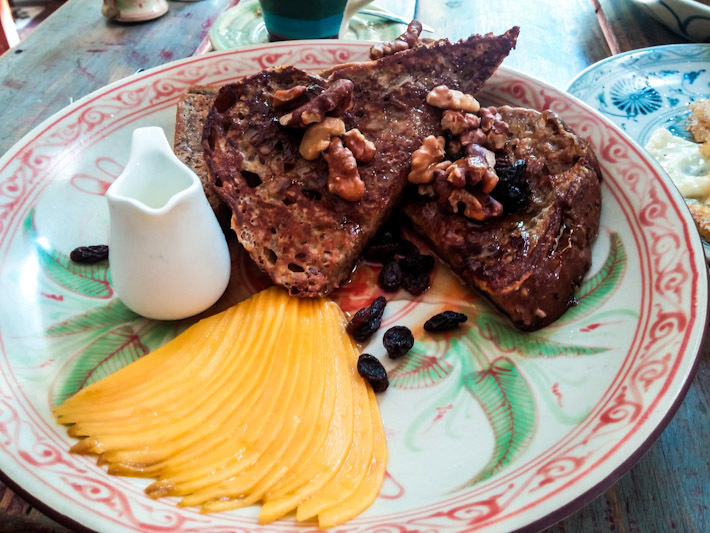 We sampled their breakfasts one morning – I had the French toast, while Ankit opted for the poached eggs with morning glory. 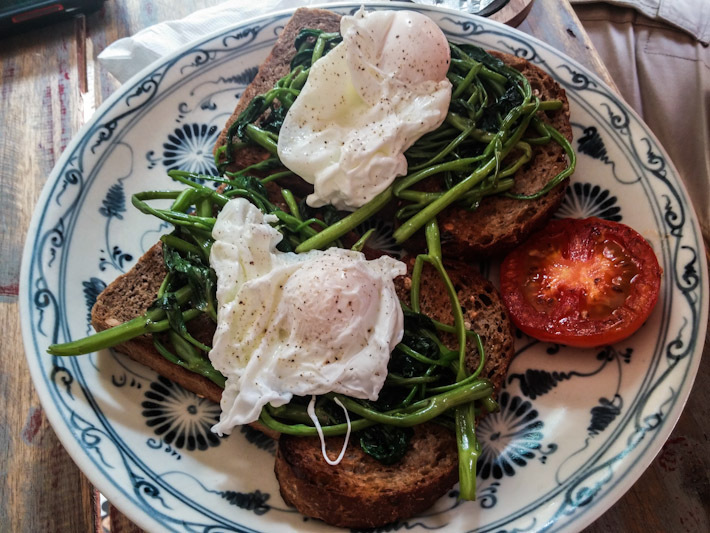 I don’t say this lightly when I say it was the best breakfast I’ve ever had. Go and try it for yourself and believe it! Comfort level? The tables are a little small for two laptops, but there’s a large table at the back, which is good to use when it’s free. Conclusion: Every time we visited this place, it was quiet, which was made it a very conducive environment to work in. And the breakfasts alone are worth making the trip here for! You have to refuel, after all! The lowdown: This is the perfect cozy spot to curl up in and work in between trekking around chilly Sapa. Located on one of the town’s main roads, it’s hard to miss this place. The coffee? We tried their latte, which was pretty decent. What about the nosh? Cannot comment. Comfort level? Every cozy café knows the importance of massive sofas. The Hill Station is no exception. WiFi? As fast as can be. Conclusion: Great place, great coffee and great sofas. Despite the fact we only visited once, we definitely think this place meets the grade and would have spent more time there had we been in town for longer than a day. Andrea and her partner Ankit quit their jobs and left Dubai to co-edit Scribble, Snap, Travel – a blog full of snappy travelogues, wow-factor photography and practical advice. 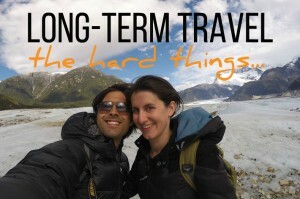 Andrea is a journalist and Ankit is a photographer, and together they travel the world. Catch them on social media: Facebook, Twitter and Instagram. 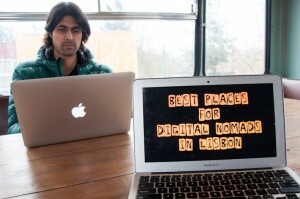 Are you a digital nomad too? Share one of your stories with us here on Backpack ME! Oh, this is perfect! What a great guest post. 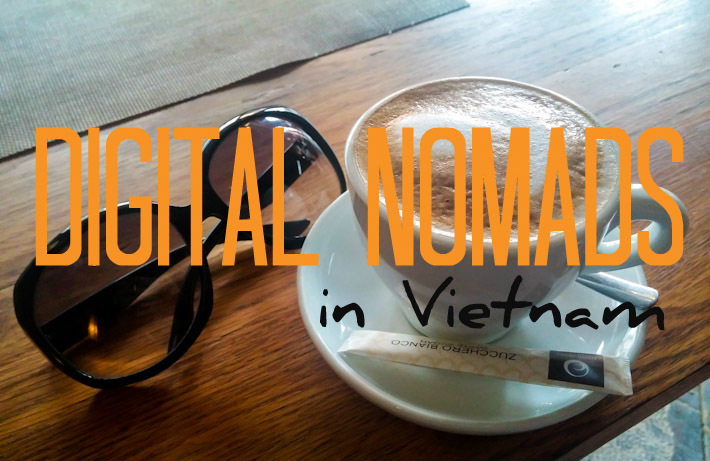 I’m always looking for this trifecta of digital nomad requirements when I get to new places. Thanks so much for this! I’m glad you found it useful, Sam :-) Same here – we’re always trying to sniff out the best places to work from. Awesome article guys! As more and more people are becoming digital nomads/location independent, I think it’s important to share articles like this one. 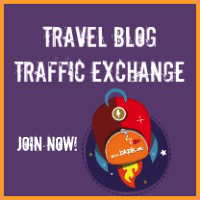 We’re all looking for the best spots to work throughout the day and I love that you gave such great info on where to work/eat/find wi-fi in Vietnam. 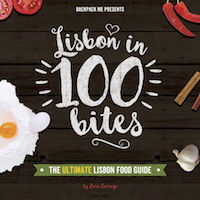 I wish there were a guide like this to every country – would make our lives much easier :-) I’m glad you found it useful! Very nice article. Well written and informative. Unfortunately I didn’t have access to this when I visited last year. But hey! There’s always a next time! Thanks for the information. I loved Windmills Cafe in Da Lat. 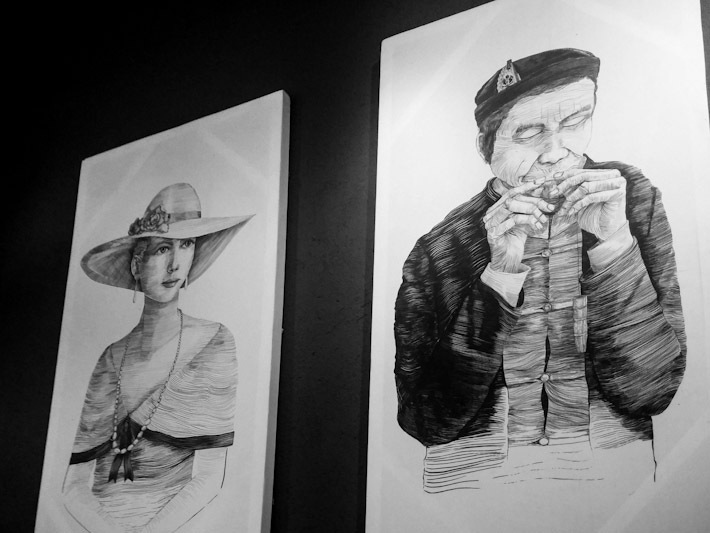 Did you visit Cochin Cafe in HCMC? That one was my favorite – using British phone booths as doors between rooms, for example. Didn’t make it to Cochin, Adam. But will definitely check it out the next time we’re in HCMC. We’re always looking for new places to work from! Nice Collection! :) I enjoyed drinking coffee in Vietnam. really a country for coffee lovers! Glad you like it! 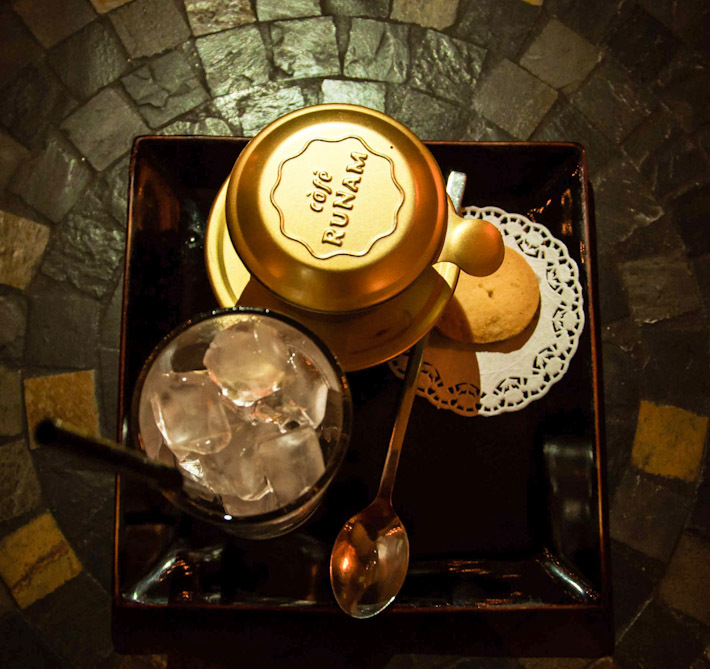 Yeah, we love Vietnamese coffee. After travelling around India for the last month where the coffee is shockingly bad (that’s what happens when you’re in a country of tea lovers!) I’m gasping for a good ca phe sua da! 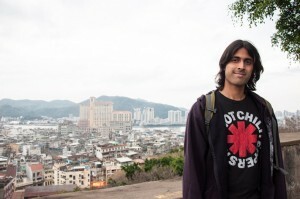 The entire above post does not portray that Vietnam is a digital nomad place rather I found it interesting. I have never been there but i will surely travel to Vietnam someday. Thanks a lot for the wonderful post. Great post, I too work off my laptop and having a good set up at a cafe is rare to find. fast reliable wifi, good space, wall power socket, atmosphere and of course good coffee. Thanks for your sharing! 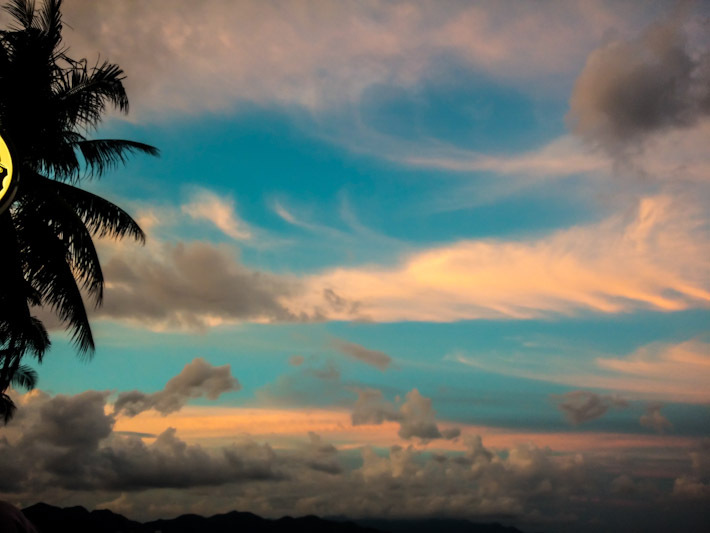 I think you can try moving to Da Nang – a coastal city near Hoi An to stay and work as a digital nomad because this city offers so many conditions that attracts digital nomad such as reasonable living cost, many co working spaces, cafe, fitness center, etc.